This is a carpet unlike any other produced in North America. It is completely biodegradable. This is achieved through the use of only 100% natural raw materials. The Bio-Floor line is made with a face fiber of 100% natural wool. Sizes: 4x6, 6x9, 8x10, 10x12. Custom sizes available. There are no moth proofing or stain protections applied. In conjunction with this we use only naturally pigmented wool fibers for coloration as opposed to any of the harsh dyes and chemical bonding agents other carpet manufacturers' use. 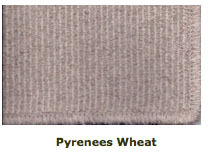 To further differentiate this carpet we use a natural primary of hemp and cotton. This is used instead of the traditional synthetic polypropylene primary. The primary is the material that the tufting machine places the wool yarn into and acts to hold it in place. Our lowest pile product constructed from the finest all natural wool available. At 30 ounces, Dolomite is not as thick as our other products but it still has excellent durabilityit is suitable for all residential applications as well as light commercial. 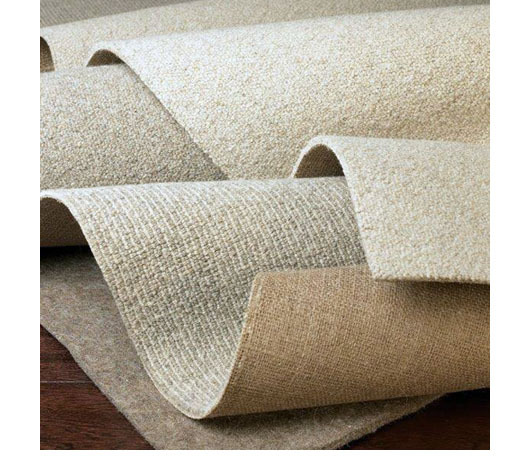 Our most popular carpet offering a muted elegance, McKinley can be either dressed up in a formal application or used in a bedroom/foyer/den to gain the comfort that comes from the finest all natural wool available. 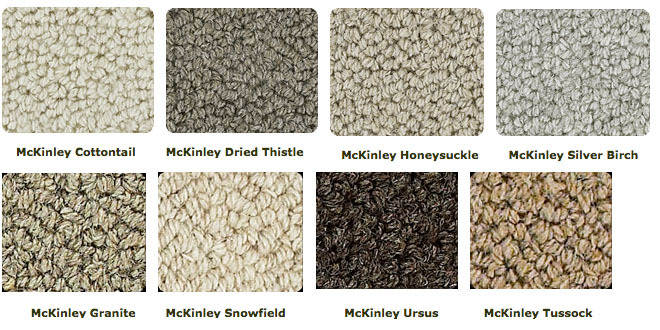 McKinley is suitable for all residential as well as light commercial applications. Our newest carpet offering showcasing a random tip shear; the combination of cut and uncut loops gives this carpet a slightly more formal look than our other offerings. Excellent durability and comfort is achieved using the finest all natural wool available. Rainier is suitable for all residential as well as light commercial applications. Our mid-weight carpet style constructed with a distinct two color pattern. The alternating rows of color are even in height and give a somewhat sisal appearance but with the durability and softness of the finest all natural wool available. Pyrenees is suitable for all residential as well as light commercial applications.